If you've felt the urge to calm your nerves with an adult beverage amidst the perpetual stress from current events, you aren't alone. In fact, a recent study by the American Medical Association shows that more people in the United States are drinking than ever before. And while the country at large may be consuming more alcohol, certain cities seem to have a much heavier pour than others, according to new data on how much cash people are dropping on booze in the nation's biggest cities. 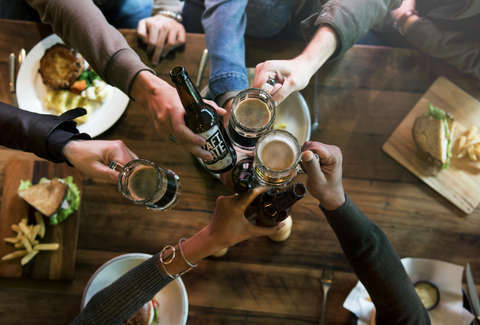 This fresh look at the spending habits of drinkers around the country comes courtesy of of 247WallSt.com, which compiled a bunch of information on expenditure data from the Bureau of Labor Statistics' 2017 Consumer Expenditure Survey. In it, they looked specifically at how much people in each city are spending on alcohol on average per year there, then ranked their findings accordingly. The city where people spend most on beer, wine, and spirits is San Diego, where the annual average is $1,112. That's nearly triple the $385 people spend on the same stuff in Atlanta, which lands at the other end of the spectrum. Here's how 22 cities ranked in terms of the average amount of money spent per person on alcohol per year. It's also worth noting that the average amount all Americans spend on booze has gone up $100 since 2007, the average increase in price for booze has only gone up about $11, per the study. Judging by the ranking, you'd expect the biggest drinkers to be out West, since four of the five cities at the top of the list are along the Pacific Coast. That may be true, but as 247WallSt points out, the average spend per person on booze in three of them (San Francisco, Seattle, and San Diego) has actually gone down since 2016. Still, you may be wondering why certain cities (New York, Miami, LA, etc.) that are well known for their nightlife culture aren't ranked closer to the top. Thats certainly open for debate, but it may be because of the way people in those more relatively expensive cities decide to allocate their funds, or perhaps people in certain places aren't being totally up front about how much they actually spend on booze. Or, to take the optimistic view, maybe it's because they're just better at finding the cheaper happy hours.